The Oval Office has been no stranger to furry residents since its construction in 1800. All but two US Presidents have kept pets while they served the public in office. Although we commonly think of the First Pet as a dog, former presidents have kept animals ranging from dogs, to cats, ponies, birds, and even a badger! While many pets fly under the radar during their time at the White House, a few have had more than their share of five minutes in the spotlight. Here, we talk about a few of the US presidents’ most notable First Pets. 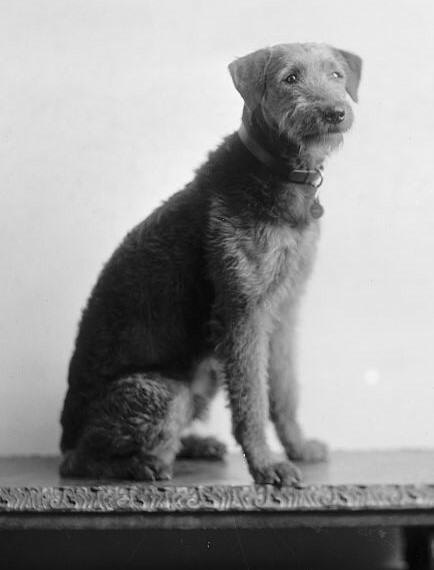 Belonging to President Warren G. Harding and his wife First Lady Florence Harding, Laddie Boy was a male Airedale Terrier, and was a gift to the Harding’s from a kennel. He became a celebrity during his time at the White House due to his incredibly loyal nature, even joining the President in his own hand-carved chair for Cabinet meetings. President and First Lady Harding’s Airedale Terrier, Laddie Boy. Public Domain image via Wikimedia Commons. 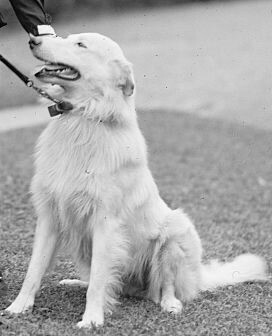 Laddie Boy was regularly covered by national press, and the Harding’s were clearly fond of the terrier, hosting birthday parties for him and other neighborhood dogs at the White House. First Lady Florence Harding also used Laddie Boy as the poster dog in her national campaign for animal rights while in office. Eventually, Laddie Boy was famous enough that he was even given a caretaker during his time in the capital. After President Harding’s death in 1923, Florence gifted Laddie Boy to the Harding’s favorite secret service agent Harry Barker, knowing she couldn’t care for the dog by herself. Laddie Boy lived a quiet and happy life with Barker and family until his death in 1929, at the age of eight years old. Teddy Roosevelt and his family were well-known animal lovers during President Roosevelt’s early 20th century tenure in the White House. Their home saw a proliferation of animals, ranging from the typical dogs, to more exotic pets like a baby black bear (who was shortly after gifted to the Bronx zoo). Around 1903, the Roosevelts gained their most exceptional pet, following the President’s railroad tour of the West. While visiting Kansas State during this tour, Roosevelt was approached by a young girl named Pearl Gorsuch. The 12 year old girl reportedly asked the President if he would like to have a pet badger. Roosevelt must have answered to the affirmative, as Pearl ran off before returning to the President with a two-week old badger cub, and her entire family. After entertaining the Gorsuch’s, Roosevelt took the young badger home, which he named after Pearl’s father, Josiah. The young badger was a hit with Roosevelt’s children, especially his youngest daughter Ethel, and his son Archie, who he was eventually gifted to. Josiah required protection during his early days at the White House, as other Roosevelt pets may have seen the cub as food. Unfortunately for the Roosevelts, as Josiah grew, his temperament also soured. After his playful leg bites became less friendly, the Roosevelts were forced to write to the Bronx zoo, asking if they would keep the badger (as they had the family black bear). Josiah lived the rest of his days at the zoo with frequent visits from the Roosevelt children, who wanted to be sure the young badger knew he had not been abandoned. 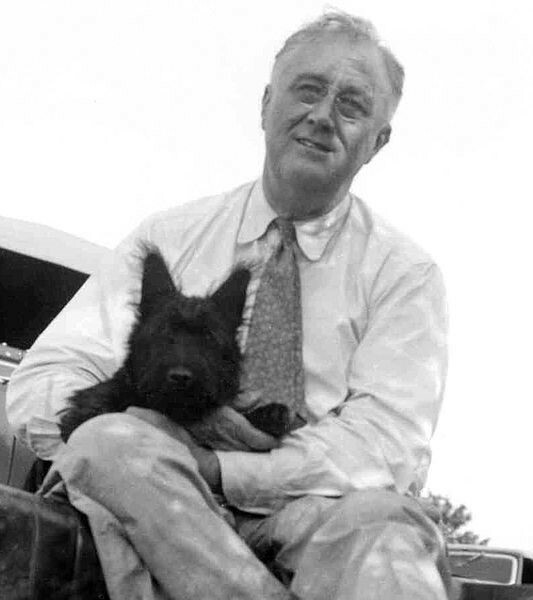 The favorite of President Franklin Roosevelt’s pets, Fala was a small male Scottish Terrier, who was known to accompany the President on many of his trips worldwide. He was gifted to the Roosevelts by a cousin, who had trained the dog to perform several tricks as a puppy, including how to roll over and jump. Although originally named Big Boy, President Roosevelt renamed the dog Murray the Outlaw of Falahill, which was eventually shortened to Fala. Shortly after becoming a member of the Roosevelt family in the spring of 1940, Fala was moved to his new home at the White House. Once there, Fala assumed considerable celebrity status, and was portrayed in several films. He also became an honorary private of the U.S. Army by setting a “good example” for those on the home front. President Franklin D. Roosevelt with his terrier, Fala. Public Domain image via Wikimedia Commons. The attachment between President Roosevelt and his dog eventually led to detractors using the dog as a tool to attack the President during his third tenure. During his 1944 presidential campaign for a fourth term, Roosevelt delivered was is today known as the infamous “Fala Speech.” Republican opponents had recently accused the President of leaving Fala on the Aleutian Islands during a tour, and sending a Navy destroyer to rescue the dog, at an outrageous cost for taxpayers. The speech was received with uproarious applause and laughter, and has been credited with helping build Roosevelt’s popularity as he sought reelection. Unfortunately for Fala, his master passed away in 1945. After Roosevelt’s death, Fala continued to live with his widow, former First Lady Eleanor Roosevelt, until his own passing in 1952. Fala has been commemorated with several statues, the most famous of which is at the FDR Memorial in Washington, D.C.
An all-black American shorthair cat, India belonged to the family of President George W. Bush, who acquired the cat when the Bush twins were around nine years old. India stayed with President Bush and First Lady Laura Bush when the Bush twins went to college, and subsequently moved from the Texas Governor’s Mansion to the White House. India received significantly less press coverage than other Bush pets during the family’s time at the White House, as the media focused on the Bush’s Scottish terriers Barney and Miss Beazley. However, India could still be seen in videos produced by the White House near Christmastime, and was also featured in photos taken in the East Hall of the White House. Also referred to as “Willie,” India lived a relatively quiet existence during her time in the Oval Office. What India lacked in coverage, however, she made up for in controversy. During the summer of 2004, demonstrators in the Indian city of Thiruvananthapuram criticized the cat’s name, calling it an insult to the Indian nation. They also burned a statue of President Bush in protest. These demonstrations did not persuade the Bushes to change the cat’s name, as she had been named by daughter Barbara Bush after baseball player Ruben “El Indio” Sierra as a child. Despite the controversy, India lived a long life with the Bush family, passing away in 2009 at the age of 18. A collie belonging to President Calvin Coolidge and his wife First Lady Grace Coolidge, Rob Roy was the favorite among a menagerie of pets that the Coolidge’s kept, including dogs, cats, birds, and even a couple of raccoons. Rob Roy was acquired by Grace Coolidge, who developed a love for Collies after seeing one perform at the circus. Although bought for Grace, Rob Roy quickly became the favorite of Calvin, and was extremely loyal to the President, who described him as a “stately gentlemen of great courage and fidelity.” Rob Roy is said to have led President Coolidge to the Oval Office each morning in a “stoic manner,” as serious as the President himself. Coolidge also reportedly tried to trick Rob Roy repeatedly into chasing animals on screen during films, although the success of these attempts frequently left something to be desired. Rob Roy, dog to President Calvin Coolidge. Public Domain image via Wikimedia Commons. While much loved by the Coolidge’s, Rob Roy fell ill at only five years old with an unknown illness. He was taken to Walter Reed Army Medical Center, where he was unsuccessfully treated and later passed away in 1928. His passing was hard on the Coolidge’s, but the dog was successfully immortalized prior to his passing in the Chandler Christy portrait of Grace Coolidge, where Rob Roy stares directly up at his owner. Today, the portrait hangs in the White House China Room. To learn more about the lives of US Presidents, check out the books below! Did you know presidents have kept animals like badgers while in the White House? Let us know in the comments below!